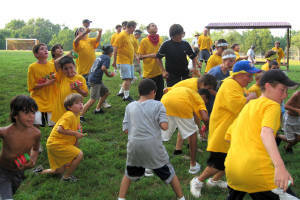 For those of you who have been Googling for the SGF Vacation Camp website - here it is. If this is your first shot, lucky you. If your camp spirit has been locked away with your combination underwear for decades, this is where to find it again. 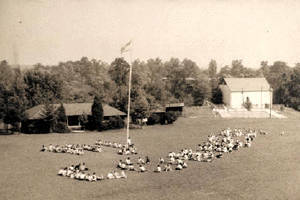 Our camp made boys into men and men into boys from 1922 until it closed in 1978. Although the Collegeville campgrounds have been dormant for more than 30 years, SGF's spirit beats inside six decades of old SGF-ers. SGF's rebirth began in June 2005 - at an amalgam of The Big Chill and Meatballs - when four unlikely guys - Spencer Glass, Scott Kleiman, Alan Saionz and Hall of Fame counselor Steve Funt - held a mini-reunion to visit the old SGF campground. At the SGF Photo Gallery you will see that, while many of SGF's vestiges remain, most of the camp is in shambles. Familiar buildings were either wrecked or altered since SGF's campfires went cold in 1978. As they walked from the Indian Ridge to Lake Lou, through the nature hut, and up to the Hill, those four felt the spirit and began to relive some of their great SGF memories. They spent three hours, walking, looking for old names painted in the dilapidated bunks. Remember them? Apache, Blackfoot, Comanche, Delaware, Erie, Featherhead, Geronimo, Hopi, Iroquois, and Kickapoo. And 1 to 9 on the Hill, plus the Taj. Do you remember why there was no “J” bunk? They unanimously decided to build something that would, at least, resurrect the SGF memories! And they did! Within three years, they had formed the SGF Club and SGF Foundation and began SGF's rise from the ashes with Overnighters starting in 2008 for a new generation of SGF kids and staff. From that Overnighter, we hope to build SGF back to what it was when we shivered to The Monkey's Paw, ran around as candy dropped from the sky, and shouted "hot stuff, Oscar." If you ever attended or worked at SGF, this website is dedicated to you. So, please sign the Guestbook, check recent announcements, share your stories, see what the corrosive effect of time has done to some of your former counselors, and see whether you want to be part of the new SGF. We've got a lot to do.